Forest tent caterpillars are starting to chow down on Winnipeg trees, prompting the city to take action. The city's insect control branch announced Thursday the start of its control program against the critters, which can quickly clear a tree to its bare branches. Spraying will begin May 31 at 9:30 p.m. throughout insect management area 49 and crews will continue to identify areas of the city — boulevards, city cemeteries and parks — where trees require treatment. Current surveillance information indicates that the forest tent caterpillar larvae are feeding on the leaves causing many small holes known as "shot hole" damage. However, most areas of the city are expected to have minimal damage except on some localized streets where major defoliation may occur. 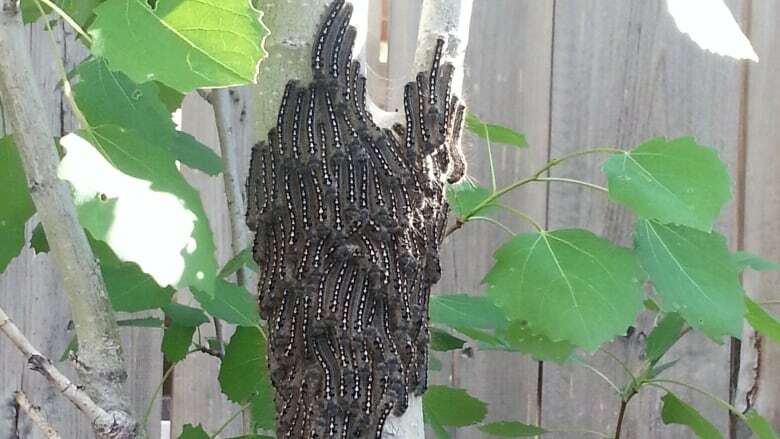 The caterpillar larvae typically feed on American Elm, Manitoba Maple, Green Ash, and ornamental trees. A daily public service announcement (PSA) will be issued on what areas of the city will be sprayed the next day. The announcement will also be posted on the city's Insect Control News/Public Notices website. Spraying will occur daily from 9:30 p.m. to 6 a.m., weather permitting. Treatment will be conducted utilizing Bacillus thuringiensis var. kurstaki (Btk), a biological, organic product which is sprayed from high pressure tree sprayers directly onto the foliage of the trees, the city said. Once the Btk is ingested by forest tent caterpillars, they stop feeding and die approximately two to three days later. Other defoliating insects, such as elm span worms and cankerworms, might require treatment this season but not yet, the city said. The public will be notified if a control program for those is required. Homeowners are responsible for forest tent caterpillar control on their property and can spray their own trees with Btk, which is available at most home and garden centres. Residents can apply for a 30-metre buffer zone in order to exempt their property during a forest tent caterpillar treatment program. In writing to Insect Control Branch at 3 Grey Street, Winnipeg, MB R2L 1V2. In person at 1539 Waverley St.
A 72-hour turnaround time is required for processing.